4026 1855 Laser Hot Hits. Oldies. SINPO 34333. 6270 1708 Free Radio Bumblestock. ID, instrumental music, best on narrow filter due to nearby strong utility. SINPO 33333. 6290 1748 Radio Odynn. "Thunderstruck" AC DC, testing new transmitter but band fading out. SINPO 34333. 6325 1847 Little Feat Radio. Barry White song, then Joe Walsh "Life's Been Good." SINPO 44433. Last Sunday propagation conditions were not the best (lots of static noise). On top of that there was a total fade out on SW just before 12 CET and it took more than 2 hours before the signal had fully recovered. And if that's not enough...our afternoon stream was affected by a technical break. Taking all this into consideration, we have decided to give it another try next Sunday November 3rd, same times, same frequencies! Despite the low power, 9301 kHz was doing fairly well last Sunday. Keep an eye on it as it was sometimes stronger than 7700! letters which haven't been handled so far. That's a promise! 4026 2010 Laser Hot Hits. Gary Drew with 80s soul & funk. SINPO 44433. 6849 2000 Radio GSV. Blues rock. SINPO 34333. Our programmes are in English, Deutsch and Nederlands. Also you can win on every Sunday great prizes as DVDs, Mi Amigo pens, Mi Amigo lighters, Mi Amigo postcards and also a brand new tablet pc. So, don't forget to tune in !! 3930 1735 Free Radio Victoria. Dutch songs. SINPO 34333. 4026 1740 Laser Hot Hits. Dance music. SINPO 34333. 5926 0953 Time Radio. "Don't Look Back," SINPO 44433. 6205 0945 Laser Hot Hits via Magic 6205. "Anyone Who Had a Heart," fair peaks. SINPO 24332. 6237 1710 Radio Deutsche Schallplattensender. German songs. SINPO 54444. 6250 0836 Radio Casanova. Rubettes "Sugar Baby Love," SINPO 44433. 6255 1715 Radio Telstar South. Peter Sarstedt song. SINPO 544444. 6260 0832 Radio Northpole. Lighthouse Family. SINPO 34333. 6286 1745 Radio Telstar. "Whole Lotta Shakin Going On," greetings. SINPO 54444. 6290 1705 Radio Rode Adelaar. Dutch songs. SINPO 54444. 6295 0835 Radio Quadzilla. Oldies. SINPO 24332. 6305 1750 Radio Supersound. Oldies. SINPO 44433. 6320 0853 Radio Montferland. Sade song. SINPO 54444. 6325 1700 Radio Jan Keizer. Another name for Black Bandit. Dutch songs. SINPO 54444. 6396 1721 Weekend Music Radio. Talking about Alvin Stardust, "Red Dress". SINPO 44433. 6425 1730 Radio Ronalisa. Oldies/ SINPO 34333. 6805 0920 Sundown Radio. "In the Summertime." SINPO 44433. 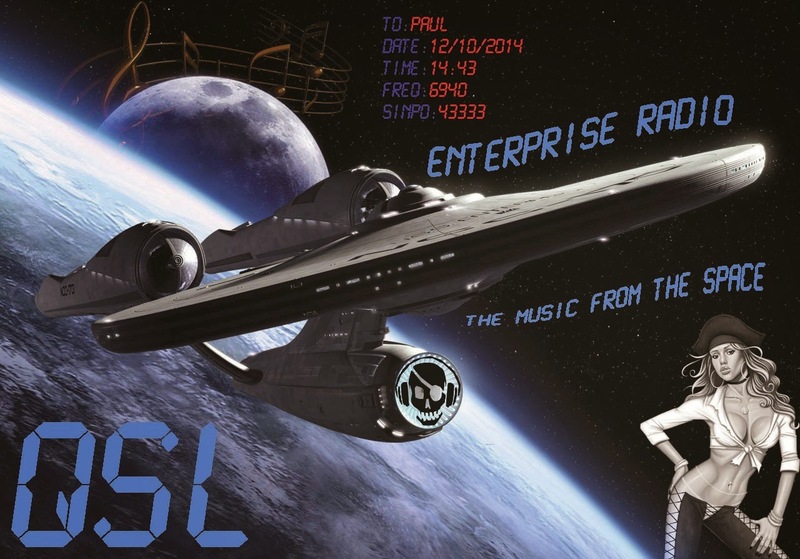 6940 1655 Radio Enterprise. "All of My Love," greetings. SINPO 54444. 6950 1650 Laser Hot Hits v Blackbeard. Martin Scott comlplaining about EU, Calvin Harris song. SINPO 44433. 7480 0845 Skyline Radio Germany. Oldies. SINPO 24332. 7700 0900 FRS Holland. Signing on for five-hour broadcast. Peter Verbruggen. Also on 9300. SINPO 54444. 9300 0905 FRS Holland. Parallel with 7700. SINPO 44433. 15700 1644 Laser Hot Hits v Magic 6205. "I Feel Like Buddy Holly," "I Won't Runaway." Show also on 6950 & 6205. SINPO 54444. 3912 1820 Radio Alice. Dutch songs, strong peaks. SINPO 44433. 4026 0820 Laser Hot Hits. Only weak signal, music just about audible. SINPO 24332. 6205 0807 Laser Hot Hits (via Magic 6205). Gary Drew show. Chaka Khan "I Feel for You." SINPO 44433. 6240 1615 Free Radio Bumbelstock. Brass Band music, ID. SINPO 34333. 6244 1803 Radio Tango Italia. Move from 6255. ID, guitar music. SINPO 33333. 6255 1610 Radio Tango Italia. "Ode to Joy," IDs. SINPO 34333. 6255 1700 Radio Telstar South. Sixties music. offshore radio chat, co-channel with another station (Tango Italia?). SINPO 43433. 6267 1751 Radio New World. Wings "Silly Love Song." SINPO 44433. 6286 1655 Radio Telstar Int. Rock n roll, greeting listeners. SINPO 54444. 6286 1830 Radio Experience. Techno. SINPO 34333. 6295 1826 Top Radio. Bryan Adams "Everything I Do." SINPO 34333. 6296 1648 Radio Joey. "Rollin' on the River," "Smoke on the Water." SINPO 44433. 6306 1605 Tower Radio. Dutch songs. SINPO 54444. 6380 0755 Little Feat Radio. KLF "Justified & Ancient," ID. SINPO 34333. 6396 0801 Radio GSV. Adele, then Amy Winehouse. SINPO 34333. 6422 1746 Radio Altrex. Oldies. SINPO 24332. 9985L 1759 Baltic Sea Radio. Stray Cats "rock this Town," ID. SINPO 44444. 4026 2004 Laser Hot Hits. Gary Drew with 80s electro-funk. SINPO 44433. 6205 1935 Laser Hot Hits (via Magic6205). Dance music. SINPO 54444. 6263.5 2010 Radio OZNRH. Mellow jazz, fair peaks. SINPO 24332. 6284 1926 Radio Underground. Joni Mitchell, Fox, ID, greetings. SINPO 54444. 6325 1921 Free Radio Victoria. Jefferson Airplane "White Rabbits." SINPO 44433. 6380 1913 Little Feat Radio. Greetings, Hall & Oates. SINPO 44433. 6396 1940 Radio GSV. Rock music, signing off. SINPO 44333. 6405 1918 Radio Ascona. Country music. SINPO 34333. 6925 1955 Mustang Radio. Tears for Fears "Everybody Wants to Rule the World," no ID til 2025. SINPO 34333. 6940 1947 Radio Enterprise. "Mr Vain," ID, email, "Horse With No Name." SINPO 54444. 6205 1710 Magic Radio. Ultravox song, ID jingle, a DXer in Spain also heard them testing on 19 metres. SINPO 54444. 6295 1700 Hitmix Radio. Instrumental music, ID, greetings. SINPO 44433. 6396 1640 Weekend Music Radio. Jack chatting about radio, Elbow Bones & The Racketeers "A Night in New York." SINPO 34333. 6747 1630 Radio Pioneer. Pet Shop Boys "West End Girls." SINPO 54444. 6205 1655 Magic Radio. Simple Minds then the Specials. SINPO 44444. 6290 1645 Radio Rode Adelaar. "Hey John Mckenzie," ID, email. SINPO 44433. 6325 1740 Little Feat Radio. ZZ Top "Gimme All Your Loving." SINPO 33333. 6396 1730 Radio GSV. Rock music. SINPO 34333. Global 24 Radio LLC announced today that its inaugural broadcast will go live at 7:00 p.m., Friday, Oct. 31 (0000 UTC November 1), with a line-up of new and well-known programs and around-the clock English language programming. The broadcast can be heard 24 hours a day, 7 days a week on 9395 kHz on WRMI broadcasting from Okeechobee, Florida. entertainment into sharper focus for listeners looking for high quality programming on a daily basis. Regular listeners will be informed, entertained and engaged in an ever more complex world. Additional press releases in coming days will announce our broadcast schedule, our Listeners’ Club, contests, sponsors, our web store, staff and much more. Follow us on Twitter at @Global24Radio or on Facebook at www.facebook.com/global24radio Visit our website: www.global24radio.com/ to join our email newsletter for the most current updates. 4026 1940 Laser Hot Hits. Gary Drew show. 80s funk & soul. "All Night Long." SINPO 44433. 4026 1930 Laser Hot Hits. Martin Scott show. Dance music. SINPO 44433. 6205 1924 Radio Magic Int. "Love Saves the Day," ID jingles. SINPO 54444. 6396 1913 Radio GSV. The Clash "London Calling." SINPO 34333. 3905 2010 Skyline International Radio. "Keep on Rocking in the Free World", greeting listeners. SINPO 54444. 4026 1554 Laser Hot Hits. "Friday on My Mind." SINPO 34333. 6205 1547 Laser Hot Hits. Tammy Wynette "Stand By Your Man," different programme. SINPO 44433. 6240 1523 Skyline Radio Germany. Rock, talk in German. SINPO 24332. 6285 1538 Radio Focus Int. Jimi Hendrix "Hey Joe." SINPO 44433. 6400 1528 Weekend Music Radio (hoax). "Radar Love," het with co-channel North Korea. SINPO 33333. 6805 1506 Sundown Radio. Pet Shop Boys "Go West," ID jingle. SINPO 44433. 7580 1500 Voice of the Netherlands. Techno. SINPO 54444. 9270 1512 Radio Spaceshuttle. "Hot Stuff," "Spanish Lullaby", also on 3905. SINPO 35333. On Sunday October 26th FRS-Holland will be on air with a full broadcast between 08:52- 15:00 UTC. Frequencies will be 7700// 9300 kHz. In the mean time FRS-Holland has become 34 years....that was celebrated with an 'extra' broadcast on Sunday evening August 31st. FRS strives to have its brand new website on-line sometime in December. The site will emphasize on FRS' 30+ year history in words, pictures & sound. We invite you as a FRS listener to put your very own personal FRS memories on paper. When did you hear us for the first time, what was (is) your favourite show, when did you get your first QSL, how much did you listen to FRS, any special on air moments you remember? All this info will be part of your personal FRS contribution. Any serious contribution will be part of the new website. We very much appreciate your input as an FRS listener! Remember that winter time starts on Sunday October 26th: UTC+1 hou r= CET . 6205 1729 Laser Hot Hits. Ace of Base "Don't Turn Around," promo for FSN. SINPO 54444. 6240 1642 Radio Casanova. ID, Dutch music. SINPO 54444. 6290 1635 Radio Rode Adelaar. Dutch songs. SINPO 54444. 6302 1713 Radio Hitmix. Jimmy Cliff "Wonderful World Beauitful People," ID jingle. SINPO 44433. 6320 1720 Radio Altrex. Bananarama song, ID, greetings, cow sounds. SINPO 34333. 6380 1739 Radio Carrierwave. Manfred Mann "Davy's on the Road Again," SINPO 44433. 6396 1734 Weekend Music Radio. Talking about listing to N.American pirates, BASF tapes, Focus song. SINPO 34333. 6915 1647 Radio Blackbeard. Dance music, Fine Young Cannibal, he said email address not working as it's been hacked! SINPO 33333. 6950 1658 Radio Blackbeard. Move to avoid utilty QRM. SINPO 34333. 4026 1952 Laser Hot Hits. Paul Stuart show. Dance music. SINPO 44433. 4890 1932 Radio Arcadia. Jazz music. SINPO 24332. 6205 1938 Laser Hot Hits. Gap Band "Oops Upside Your Head," SINPO 55444. 6290 1919 Radio Rode Adelaar. "Rose Garden," closing down soon after. SINPO 44433. 6396 1945 Radio GSV. ID, greetings, oldies, said WMR will be on tomorrow. SINPO 34333. 6747 1924 Radio Pioneer. Eagles "Hotel California." SINPO 34333. 4026 2005 Laser Hot Hits. Gary Drew show. Greeting FSN crew, "Keep the Fires Burning," SINPO 44433. 6265 1810 Radio Twentana. Dutch song, then UB40 "Red Red Wine." SINPO 44333. 6305 1839 Radio Mazda. Dutch & country music. SINPO 54444. 6315 1852 Unid. Radio London recordings. SINPO 34333. 6325 1820 Radio Zwarte Panter. Polka, bad modulation. SINPO 43332. 6396 1958 Radio GSV. Talking about Scotland-Poland match, "I Love Rock n Roll." SINPO 44433. 6450 1829 Radio Ascona. Rock music, ID. SINPO 44433. 4026 1940 Laser Hot Hits. Songs by Boston and Bread. SINPO 34333. 6205 1923 Laser Hot Hits. Roxette "You've Got the Look," different programme to 4026. SINPO 54444. 6263.5 2000 Radio OZNRH (tent). Instrumental music. SINPO 24332. 6295 1913 Radio GSV. Rock music. SINPO 44433. 6305 1907 Radio Merlin Int. Wings "Band Across the Water." SINPO 34333. 6375 1929 Little Feat Radio. "House of the Rising Sun." SINPO 34333. Quadrilla Radio used 7 watts into a GB5RV inverted-V antenna. Thanks for the QSL. Also received today was a QSL from new Italian station Radio Enterprise from north east Italy. He was using 50W with dipole. 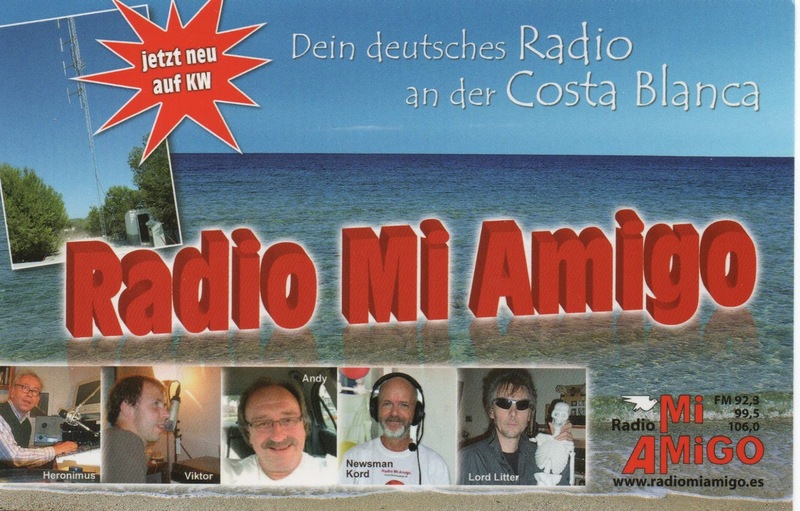 Thanks also for your QSL. 4026 1535 Laser Hot Hits. Bad Company "Can't Get Enough of Your Love." SINPO 34333. 6180 0947 Radio Scotland Int. Move from 6400. Bee Gees "Staying Alive," close down. SINPO 55444. 6205 0848 Laser Hot Hits v Magic. Gary Drew with archive recording of a London FM pirate, Solar Radio. SINPO 34333. 6239 0919 Radio Marabu. Steve Earle "Copperhead Road." SINPO 44433. 6245 0923 Radio AC DC. "Cuts Like A Knife," "Here I Go Again." SINPO 44433. 6250 1015 Radio Casanova. "Coming Home for Christmas," Dutch song. SINPO 44433. 6286 0843 Radio Focus Int. Snow Patrol "Take Back the City." SINPO 44444. 6295 0957 Top Radio. "La Dolce Vita," SINPO 44433. 6305 0932 Radio Quadzilla. "Kids in America." SINPO 24332. 6305 1425 Mike Radio. "Sexual Healing," talk in Dutch/English. SINPO 54444. 6305 1425 Radio Baken 16. 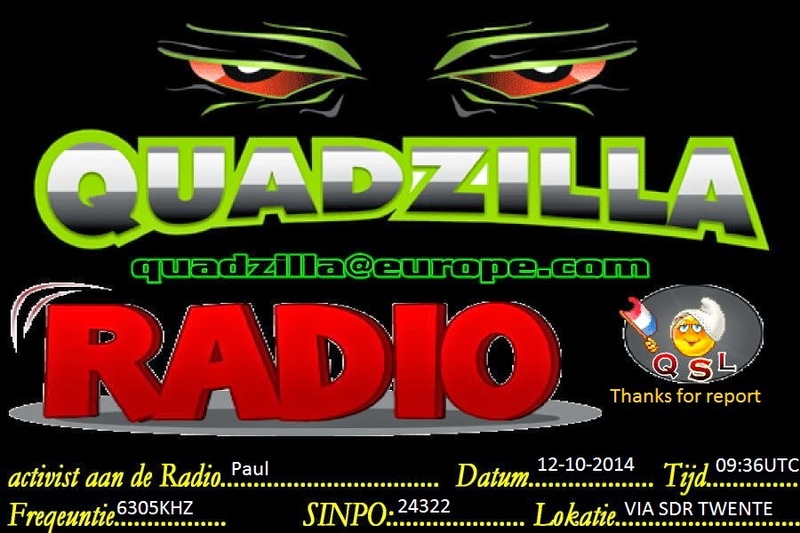 QSO with Mike, song "I want to be With You." SINPO 44433. 6318 1547 Rock Radio Network (tent). Stranglers "Get A Grip on Yourself." then Talk Talk. SINPO 44333. 6320 0900 Bogusman. Usual chat, music by band called Lawrence Arabia. SINPO 44433. 6320 1455 Trans Europe Radio. ID, said had broken foot, Flock of Seagulls. SINPO 44433. 6380 0852 Radio Carrierwave. Manfred Mann "Davy's on the Road Again." SINPO 44433. 6400 0907 Radio Scotland Int. He said only using low power - 200 watts (!). Instrumental version of OMD "Electricity," then Killing Joke. SINPO 54444. 6940 1431 Enterprise Radio. "Stairway to Heaven," "Thriller," ID and said coming from Italy, some utility QRM. SINPO 43333. 7297 1503 Radio Mistero Ghost Planet. Inst mx. QRM from station on 7330. SINPO 33333. Move to 7293 at 1506, again QRM from 7290. SINPO 33333. Heard on 7331 at 1532. SINPO 33333. 7502 1537 RMGP. Finally found clear frequency. Beyonce. SINPO 34333. Twente SDR offline so tonight listening at home with Degen 1103 portable with telescopic. 3905 2049 Radio Alice. ID, greetings, rock n roll. SINPO 34333. 4026 2035 Laser Hot Hits. Oldies. SINPO 34333. 6195 1959 Radio Flying Dutchman. ID, "Girls Just Wanna Have Fun." SINPO 34333. 6205 2015 Laser Hot Hits v Magic. "War Baby" Tom Robinson then Manic Street Preachers. SINPO 34333. 6239 2020 Radio Marabu. IDs, oldies. SINPO 34333. 6286 2030 Radio Focus Int. Oldies, weak. SINPO 24332. 6325 2010 Abu Dhabi Radio. New name for Black Bandit. Dutch and country music. SINPO 44433. 4026 2051 Laser Hot Hits. "Just Don't Want to Be Lonely." SINPO 44433. 6205 2045 Laser Hot Hits via Magic 6205. Dance music, jingles. SINPO 54444. 6396 2034 Radio GSV. Depeche Mode "Everything Counts," Thomson Twins. SINPO 44433. 6485 2028 Premier Radio Int. Recording on Irish station Q102. SINPO 44433. Long-running Dutch shortwave pirate Magic AM has been getting emails for a new shortwave station, also calling itself Magic - which is thought to be from the UK. He has warned people he will not be sending them on! The Dutch Magic AM has gone onto Twitter to say: "We are getting a lot of e-mails and snailmail for a station calling himself MAGIC int. in our mailbox and P.O.Box lately. Please note that these e-mails and snailmail will not be forwarded. We are MAGIC AM, active on shortwave since 1996, and we do not know the people behind the other station,using our name & running non-stop music on SW.We have been on air since 1996 & will stay MAGIC AM forever." 4026 1930 Laser Hot Hits. Pop and dance music. SINPO 34333. 6266 1909 Radio Odynn. Instrumental music. SINPO 44433. 6290 1915 Radio Rode Adelaar. Polka, signal fading out. SINPO 34333. 6295L 1953 Over 60 Degree Radio. Blues rock. SINPO 34433. 6396 1923 Radio GSV. Neil Young song. SINPO 44333. 6295 1705 Radio Telstar. "Rock Around the Clock," ID, greetings. SINPO 54444. 6325 1650-1703. Dutch QSO featuring Zeewolf (34333), Black Arrow (54444), Fred Flintstone (44433) and Shadowman (54444). 4026 1946 Laser Hot Hits. Dance music. SINPO 44433. 6290 1920 Radio Rode Adelaar. "Popcorn," ID, "Needles & Pins." SINPO 54444. 6299 1926 Radio Alex W. "Kiss You All Over," SINPO 34333. 6396 1939 Radio GSV. ID, rock music. SINPO 34333. 4026 1935 Laser Hot Hits. Crusaders "Street Life," jingles. SINPO 44333. 6205 1910 Radio Magic. Wet Wet Wet "Angel Eyes," ID jingle. SINPO 54444. 6284 1927 Radio Alex W. "I Want to be With You Everywhere," ID, greetings. SINPO 44333. 6325 1900 Radio Caroline-Rainbow. Oldies, IDs. SINPO 44433. 6396 1919 Weekend Music Radio. Foreigner "That Was Yesterday," then Genesis. SINPO 34333. "In an age when the airwaves were tightly controlled by the authorities, pirate radio was the illicit and illustrious haven for music lovers across the nation. From the first broadcast in 1964, the cowboys of the radio world fed their listeners' desire for pop and rock music and, by doing so, changed British radio forever. Through more than 100 crisp, black-and-white photographs, Pirate Radio: An Illustrated History brings to life the 'golden years' of pirate radio. 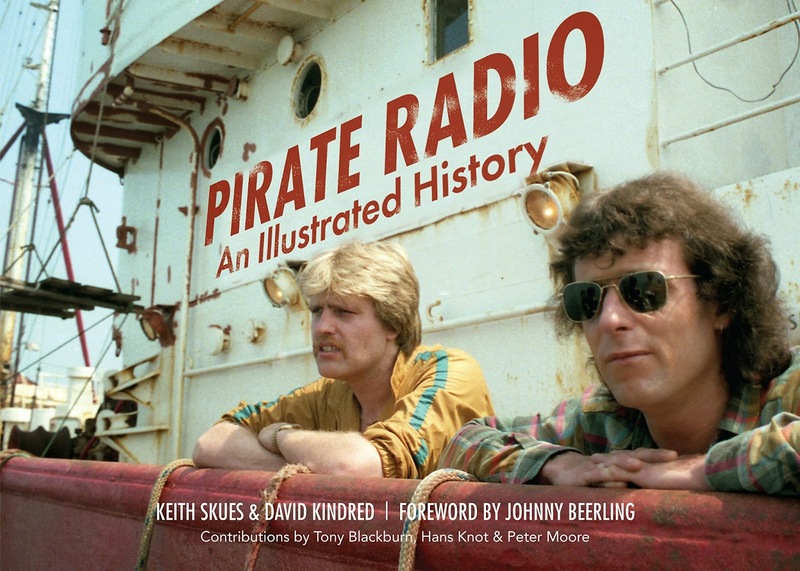 Featuring pictures of the crew, the boats and the fans, this book takes the reader on a journey from the formative years of pirate radio, through its political persecution and beyond." 4026 1628 Laser Hot Hits. Dave Simpson show. Different programme to 6205. SINPO 34333. 6200 0827 Laser Hot Hits v Magic. "Time After Time," then ELO. SINPO 34333. 6205 0832 Radio King SW. Oldies. SINPO 44433. 6205 1605 Laser Hot Hits v Magic. Culture Club "Church of the Poisoned Mind," SINPO 44433. 6216 1639 Free Radio Bumbelstock. ID, instrumental music. SINPO 33333. 6220 0912 Radio Scotland Int. White Lies "Farewell to the Fairground", testing new filter. SINPO 54444. 6235 1645 Radio Tango Italia. IDs, baby noises and "Ode to Joy." SINPO 34333. 6246 0846 Radio Underground. Beatles "Paperback Writer," then PJ Harvey. SINPO 44433. 6285 1530 Radio Condor. Techno, talk in Dutch and off. SINPO 34333. 6290 0820 Radio Orang Utan. Dire Straits "Money for Nothing," "Walk of Life." SINPO 44433. 6290 1552 Radio Rode Adelaar. Polka. SINPO 54444. 6295 0815 Radio Quintus. Dutch songs, ID, greetings. SINPO 54444. 6300 0825 Radio Norton. Dutch songs. SINPO 44433. 6308 1542 Radio Titanic. Capt John with 60s music. SINPO 44433. 6320 0852 Radio Carrierwave. Mary Hopkin "Those Were the Days." SINPO 34333. 6385 1533 Radio Baken 16. QSO, "Think We're Alone Now." SINPO 44433. 6385 1537 Radio Zeewolf. QSO with Baken, using 20W. SINPO 44433. 6390 0836 Radio Lowland. Elvis Presley "Teddy Bear." SINPO 43333. 6396 0841 Radio GSV. Blues rock. SINPO 34333. 6400 0857 Radio Deutschlandwelle. Oldies. SINPO 34333. 3905 1810 Radio Alice. ID, greetings, Dutch music. SINPO 44433. 6200 1143 Laser Hot Hits v Magic. Lynx "Romance." SINPO 24332. 6210 1717 Radio Technical Man. Version of "Please Release Me." SINPO 54444. 6255 1802 Radio Telstar South. Offshore memories, 60s music. SINPO 44433. 6265 1713 Radio Tango Italia. ID, tango music. SINPO 34333. 6280 1702 Skyline Radio Germany. Jingles, rock music. SINPO 34333. 6295 1657 Tower Radio. "Son of my Father," "Mull of Kintyre." SINPO 54444. 6305 1125 Radio Merlin Int. REM "Everybody Hurts." SINPO 34333. 6310 1743 Skyline Radio Germany. Move from 6280. Rock music. SINPO 34333. 6320 1752 Radio Altrex. "Love Hurts," UB40 song. SINPO 34333. 6396 1755 Radio GSV. Stray Cats "Runaway Boys," SINPO 34333. 6940 1135 Laser Hot Hits v Blackbeard. 10cc "Good Morning Judge", weak-fair. SINPO 24332. 15880U 1708 Over 60 Degree Radio. Blues music. SINPO 44433. 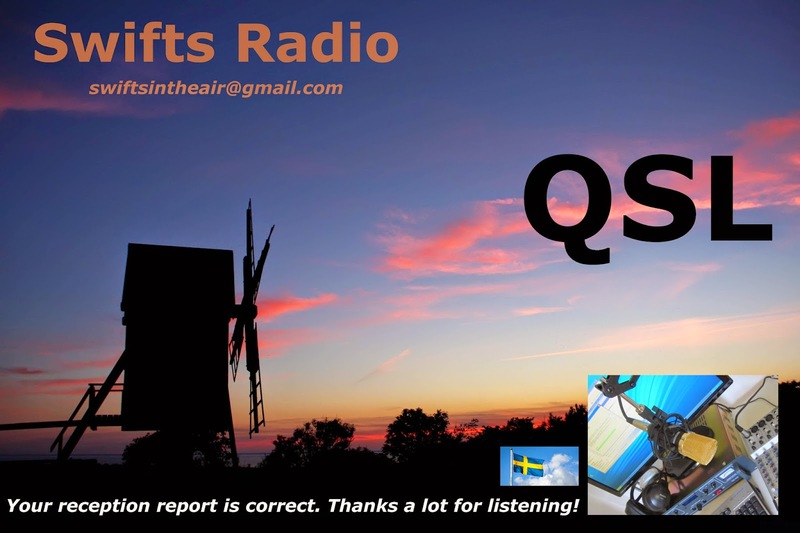 I was pleased to receive a QSL from new shortwave free radio station Swifts Radio, broadcasting from Sweden. The transmitter was running at 10W and the next broadcast is planned for November. Many thanks for the QSL. 4026 1941 Laser Hot Hits. Gary Drew show, soul & funk. SINPO 34333. 6200 1924 Radio Magic Int. Pop music. SINPO 44444. 6220 1928 Radio Witte Reus. Jeam Michel Jarre. SINPO 44433. 6240 1913 Crazy Wave Radio. Queen "I Was Born to Love You." SINPO 44444. 6323 1910 Radio Mustang. Cult "She Sells Sanctuary," ID jingle. SINPO 54444. 6385 1938 Premier Radio Int. ID, oldies. SINPO 34333. 6421 1900 Radio Altrex. ID, A-Ha "Take on Me." SINPO 34333. 6940 1905 Radio Blackbeard. George Michael song. SINPO 44433. 6200 1728 Radio Magic Int. Non-stop oldies and jingles, splash from BBCWS 6195. SINPO 32432. 6290 1722 Radio Rode Adelaar. Dutch songs. SINPO 544444. 6320 1718 Radio Telstar. "There Goes My Heartbeat," "Ally Oop." SINPO 54444. 6425 1715 Radio Zwarte Non. Dutch instr music. SINPO 34333. 6446 1712 Studio 52. Dutch songs, some utility splash. SINPO 43433. 6070 1640 Channel 292. Bruce Springsteen "Glory Days," SINPO 33333. 6150 1630 Europe 24. Started regular programmes. News in German, then "It's Raining Again." SINPO 54444. 6290 1620 Radio Rode Adelaar. Country music, ID, greetings. SINPO 54444. 6307 1715 Radio Goofy. "Money's Too Tight to Mention," ID jingle. SINPO 34333. 6395 1705 Radio Mazda. "You've Got Your Troubles," ID, greetings. SINPO 54444. 6425 1800 Test Pirate. Dutch music. SINPO 34333. 6953 1753 Radio GSV. Seventies music, ID, chat. SINPO 34333.